Homemade popsicles take almost no time to make. They are an inexpensive, healthy and refreshing summertime snack. As soon as the weather gets the slightest bit warm, my children start asking for popsicles. I'm glad to agree, because these healthy snacks are economical, easy, and healthy. Be sure to use 100% fruit juice - not a juice "cocktail" which is full of sugar. There's nothing quite as refreshing - or as fun - as a frozen popsicle on a hot day. Sucking on popsicles can soothe a sore throat, too. Keep a supply of homemade popsicles in the freezer just in case! 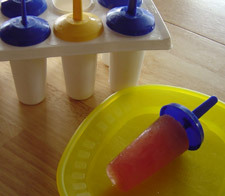 Fill the popsicle molds with fruit juice, leaving a bit of space at the top of each mold. Put in the popsicle sticks. (My kids like to do that part). Then comes the hard part: waiting for the popsicles to be ready! It will take at least a few hours. Be prepared to answer the question "Are they ready yet, Mom?" many times. Hold the popsicle maker under hot running water. Twist each popsicle stick gently until the popsicle can be removed. Then pass out the popsicles to your happy children and feel like a great mom! Instead of fruit juice, pour Smoothies into the mold. Make a batch of your favorite herbal tea. Sweeten it with honey. Use this to make very refreshing popsicles! If you prefer to limit the amount of juice your children drink, water the juice down a bit before adding it to the mold. The kids probably won't even notice! Add a couple of blueberries to each individual mold. It's fun to find frozen berries in your popsicle! Experiment with other berries, too. I like to have two sets of popsicle molds, so that there is always a batch of popsicles ready to eat while the second set is freezing. Inevitably, some popsicle sticks will get lost. You can use wooden popsicle sticks (available at craft stores), or do what I do: use a plastic baby or toddler spoon in the place of a missing stick. The short curved handle on baby spoons is ideal for little hands to grasp. Tiny measuring spoons work well, too. To speed up freezing time, be sure to use cold juice from the fridge. Return from homemade popsicles to healthy snack recipes.